When my friend Sarah invited me and my boys over for a playdate, I couldn’t pass up the opportunity to bring something tasty to share. With the fall season just around the corner, I wanted to use either apple or pumpkin. I was itching to try more of my fall favorites! 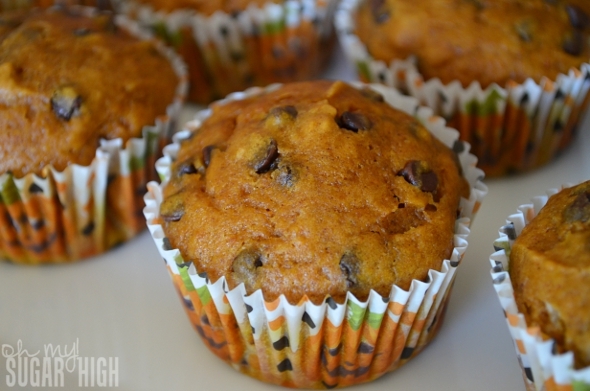 I decided on some pumpkin chocolate chip muffins which is a flavor combination I have not yet tried. So how did they turn out? Absolutely delicious! I did try one shortly after they came out of the oven and was a bit disappointed. I thought they were rather bland and wondered how that was even possible. But two hours later when we were enjoying them during our playdate, the flavors had really settled and they were perfect! They were also a big hit with the rest of my family later that evening! Preheat the oven to 350 degrees F . Line muffin pan with paper liners or grease and flour cups. In large bowl, mix together sugar, oil, eggs. Add pumpkin and water and stir. In a medium bowl, mix together the flour, baking soda, baking powder, pumpkin pie spice, cinnamon and salt. Add flour mixture to pumpkin mixture and stir just until moistened. Gently stir in chocolate chips. Fill muffin cups 2/3 full with batter. Bake in preheated oven for 20 to 25 minutes or until a toothpick inserted in center comes out clean. Note: If you prefer a few less chocolate chips or you simply want to save some calories, you can get by with as little as 1/2 cup. Likewise, 1/4 cup unsweetened applesauce can be substituted for the oil. Don’t you just want to take a bite out of me? Yeah, that is what I thought…. 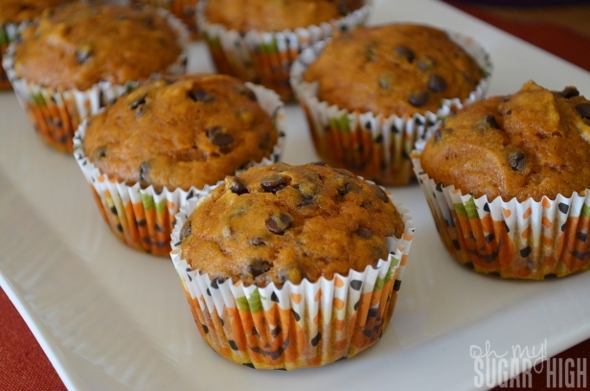 These muffins look absolutely delicious! I love the pictures you took as well. 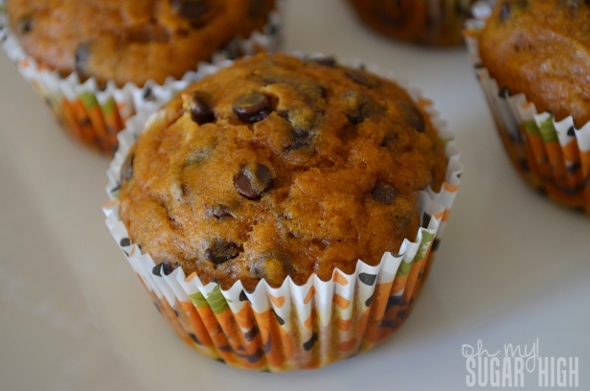 The muffin cups with the pumpkins on them are so cute, and add to the entire display. Happy Halloween! Delicious fresh out of the oven. Thanks!! omg I cant wait to make these this fall!! I’m pumpkin freak! Found you through Pinterest and cant wait to try this recipe. How much pumpkin pie spice is this? It says “1/2″…. Half of what? A Tbsp or tsp? Great catch! It teaspoon! I’ve updated the recipe. Thanks for stopping by and hope you love the muffins!